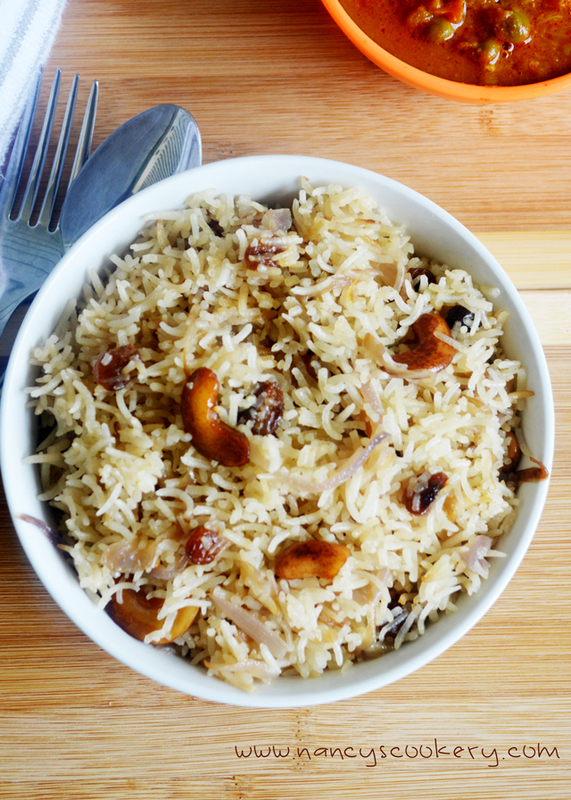 Made this ghee rice recipe when I was trying all easy rice recipes. It will be listed in almost all south Indian hotels menu. Be sure to check out the sides gravy/korma for the rice mushroom gravy, Peas potato kurma and more variety easy rice recipes that I have posted already mint pulao/rice Peas Pulao , Street food style/fast food chicken fried rice, Shrimp/prawn Rice. Flavored rice with ghee, onion and spices. 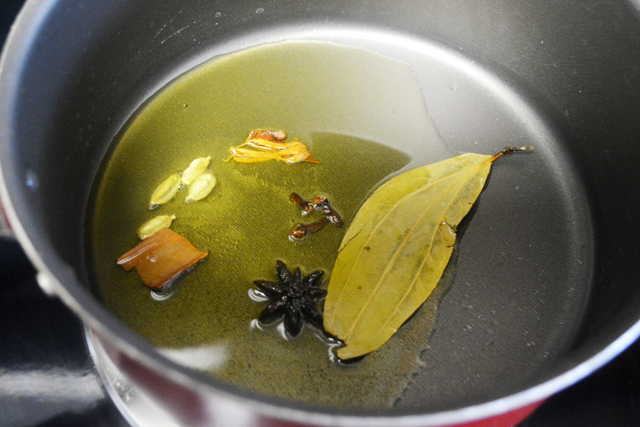 Meanwhile heat ghee in a cooking pan and put the whole spices cinnamon, cardamom, cloves, bay leaf, star anise and mace given under whole spices. 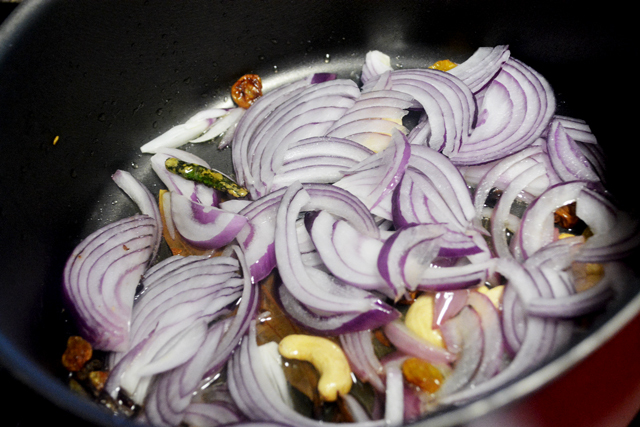 Once the spices sends aroma and get bulged, throw green chilly, then cashews and raisins and then the onions. Saute till the onions become fried(do this in medium to high flame) and not burnt with occasional stirring. 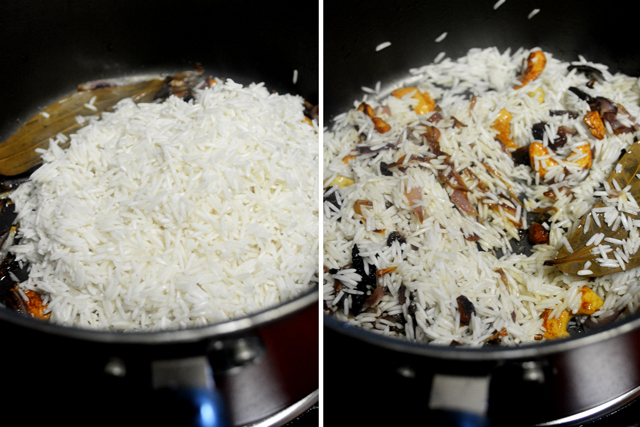 Then put rice and saute for 1 to 2 minutes in medium flame and add water to it cook covered. When the rice starts to boil bring the heat to medium from high and then from medium to low when the water is about to be fully absorbed and rice still to be cooked for perfection. Slice the onion and green chilly. Soak the rice also for 20 minutes. Meanwhile when the rice gets soaked, heat 4 tablespoons of ghee in apan. After all this is ghee rice, I have added 4 tablespoons of ghee. If you don't want more ghee, add 2 to 3 tablespoons. Put all the whole spices given under "whole spices" in ingredient list (cinnamon, cardamom, cloves, bay leaf, mace, star anise). 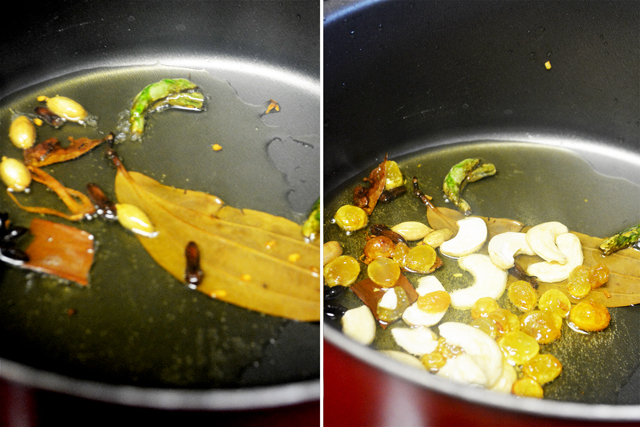 When the whole spices sends nice aroma and the cloves bulged , put green chilly and then the cahews and raisins. 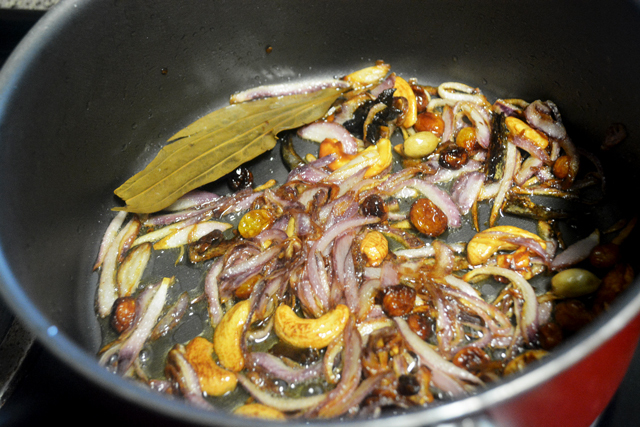 When the colors of cashew and raisins turn to brown, throw sliced onions. Saute the onions in medium to high heat with occasional stirring not letting the onions to burn, but to fry them crisp. 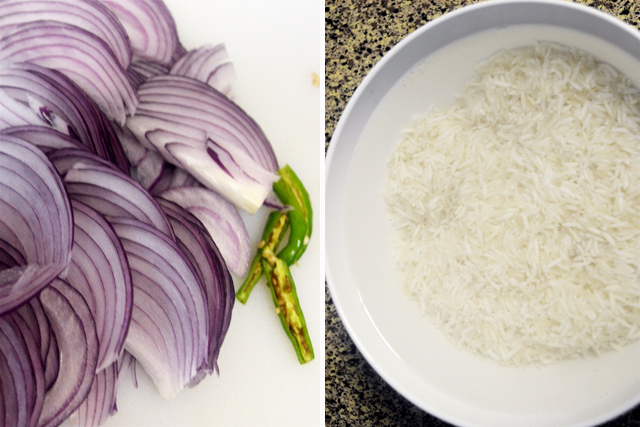 If the onions burn, the ghee rice won't taste good. So watch for it. Now put the soaked rice into it and saute for 2 minutes in medium flame with constant stirring. Now pour water into the rice. Cover and cook the rice in the same pan. If want to use pressure cooker, keep the rice for 3 whistles. 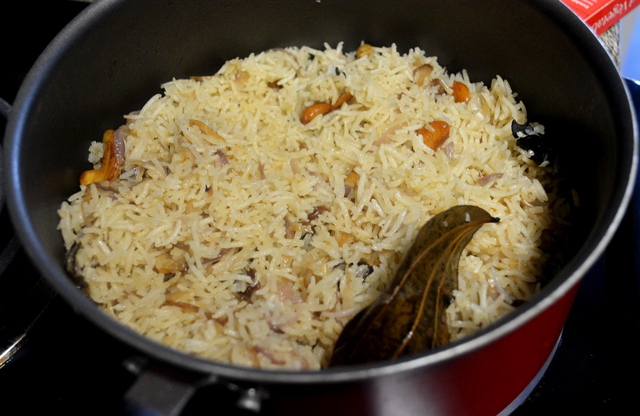 Once the rice starts boiling in the pan, reduce the flame to medium from high. 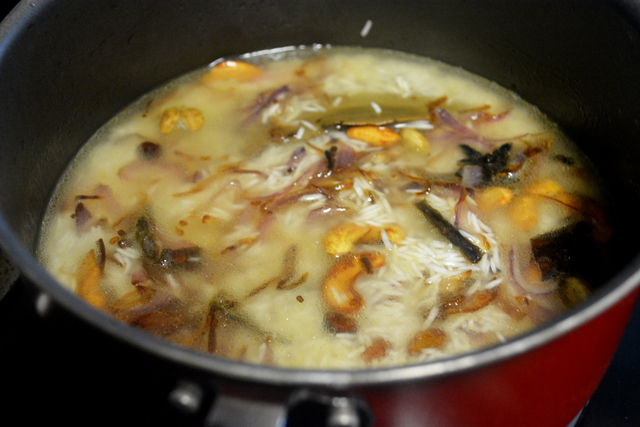 Once the water is about to be absorbed completely keep it in sim, then cook until the rice is done. 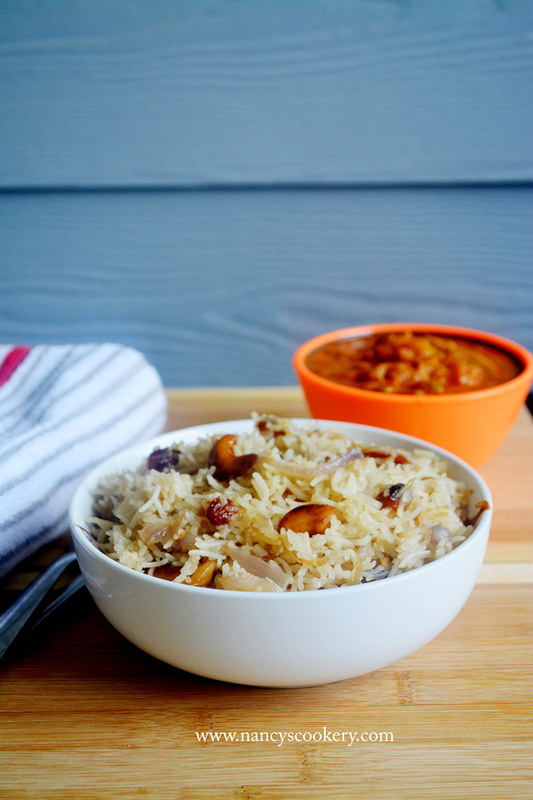 Serve the ghee rice hot with mushroom gravy, Peas potato kurma or any favorite gravy.